Peregrine Lethrbury (1752-1801) practiced law in Chestertown, and was the first professor of law (1782-1801) at Washington College. Lethrbury served as Secretary, and later President, of the Board of Visitors and Governors of Washington College. In 1776, and again in 1779, he had been elected to the General Assembly of Maryland. He became a major in the county militia in December 1781. He was a member and Past Master of the Lodge at Chestertown, No. 7, under Pennsylvania, but afterward No. 2, under Maryland (the name of the lodge is unknown). He appears not to have been present at the Conventions held in 1783 for the formation of the Grand Lodge of Maryland, but was present at the one held in 1787, as a Delegate from Lode, No. 7. 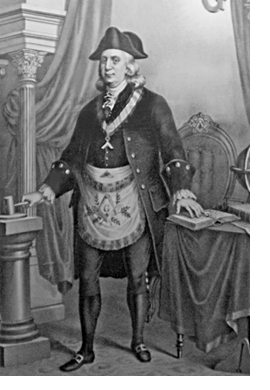 Upon the organization of the Grand Lodge during the 1787 convention he was unanimously chosen Deputy Grand Master, and was annually reelected to the this position until 1791, when he was elected Grand Master, serving for one year. The same year he purchased ‘Denton House,’ also known as the ‘Denton-Weeks House,’ and the ‘Smyth-Letherbury House,’ a historic five-bay brick townhouse located at 107 Walter Street in Chestertown, Maryland. He was a member and Officer of the Royal Arch Chapter, attached to Lodge, No. 7 at Chestertown, and his name appears upon the Charter or Dispensation issued by that Lodge, 1787, for the Royal Arch Chapter attached to Fellspoint Lodge, No. 15 under Pennsylvania, later Washington Lodge, No. 3 under Maryland. He appears to have been heavily connected with Washington Lodge, No. 3 having acted as the lodge’s proxy at the Grand Lodge of Maryland’s meetings when they meet in Easton, Maryland. Late in life he became entirely blind, but continued to practice law. His only daughter, Mary Lethrbury (?-1849), who later married Dr. George W. Thomas (?-? ), a physician in Chestertown, aided him by reading papers for him.